Advanced Dungeons and Parenting: Crazy Kill Bill Parody! This is why I love the Interwebosphere! Monday's article discussed the upcoming CBS/Aardman Animations production Creature Comforts. I am running through my, four times and hour, check to see if Cinerati has had any visitors/comments and lo and behold I have a comment! Only I have no idea what it says. I don't speak Spanish or Portuguese, and I can't really tell the difference between the two when written, so you'll have to translate yourself. I have never received spam in the haloscan hosted comments before, the comments appeared to have the words "animation and 3D", and the commentator had left a kind emoticon, so I clicked onto Azusa's homepage. What I found there was one of the bright spots in my day. 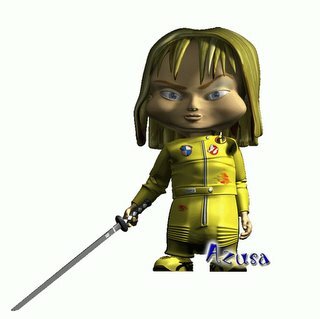 It appears that Azusa is working on an animated parody of Kill Bill entitled Bill Kill. Anyway, it features a superdeformed rendition of Uma that has to be seen to be believed. Azusa, and your assistant P Chan (an entertaining character from Ranma 1/2, thanks for stopping by Cinerati.